If you like the slow cooked flavor you get from a pot of beans but don’t have the time, this recipe is for you. We are taking a BIG shortcut and using canned beans – but shhhh! If you don’t tell, I won’t!!! This is a recipe I shared almost two years ago. I cooked it via live feed on Facebook earlier this week and enjoyed it for dinner tonight. Here’s the deal…bean soups get better with time. I thought about it and I know it’s truly worth sharing with you again! 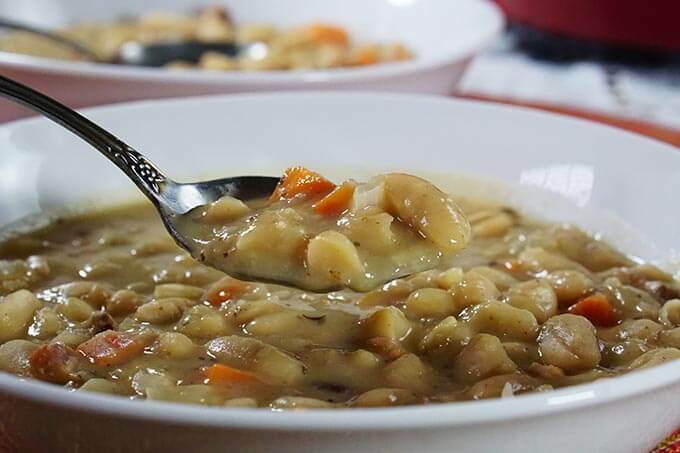 I know one of the reasons you subscribe to my site is because of the soup recipes, so here is an excellent bean soup that takes less than 30 minutes to make! Bean soups are always a staple in our home. But all that delicious flavor takes a llloooonnnnggg time to develop. By the time you soak the beans overnight, chop all the veggies, and simmer it on the stove, you have several hours into making just one meal. No one has that amount of time, right? Now you do! Today I want to share my easy recipe for Homemade Bean with Bacon Soup. It has all the flavor of a slow cooked bean soup, but only takes 40 minutes to make! You’re going to use a few shortcuts from your pantry to bump up the flavor and speed up cooking. It’s totally worth it! You’ll start by cutting the bacon into a small dice and putting them in a heavy bottom stock pot on the stove. After the bacon is diced and put into the pan, turn on a medium heat. Putting the bacon into a cold pan and cooking it slowly will allow the fat to render from the bacon, leaving you with just the crispy pieces! This will take 10-15 minutes. While the bacon is cooking, chop the onion, peel and dice the carrot, mince the garlic. Open all the cans of beans. Drain three cans and rinse them well, set them aside to drain. Open the fourth can, do not drain. Pour everything from the fourth pan – juices and all – into a blender. Add 1/4 cup chicken stock. Blend until smooth and creamy. When the bacon is crispy, remove it from the pan with a slotted spoon, Place it on a paper towel and allow it to drain. Remove the excess grease from the pan, but be sure to leave the browned bits, we want all that flavor! Add just a tablespoon of olive oil to the pan followed by the onions and carrots. Season the vegetables with Italian seasoning, black pepper and red pepper flakes. Sauté over medium heat for 3-4 minutes until the vegetables start to soften and begin to brown. Easy Bean with Bacon Soup! Soup is good food!! Add the minced garlic and saute another minute or so. Next deglaze the pan with a couple tablespoons of white wine, being sure to scrape the brown bits off the bottom of the pan. Now add the reserved beans, blended beans and remaining chicken stock to the stock pot. Increase heat to high and bring to a boil. Reduce heat to medium and simmer at a low bubble for 15 minutes stirring occasionally. Remove from the heat. Add the bacon back in at the end, a squeeze of lemon and freshly minced parsley, give it a good stir. Check the seasoning. You may need to add salt, but only 1/2 teaspoon at the most. 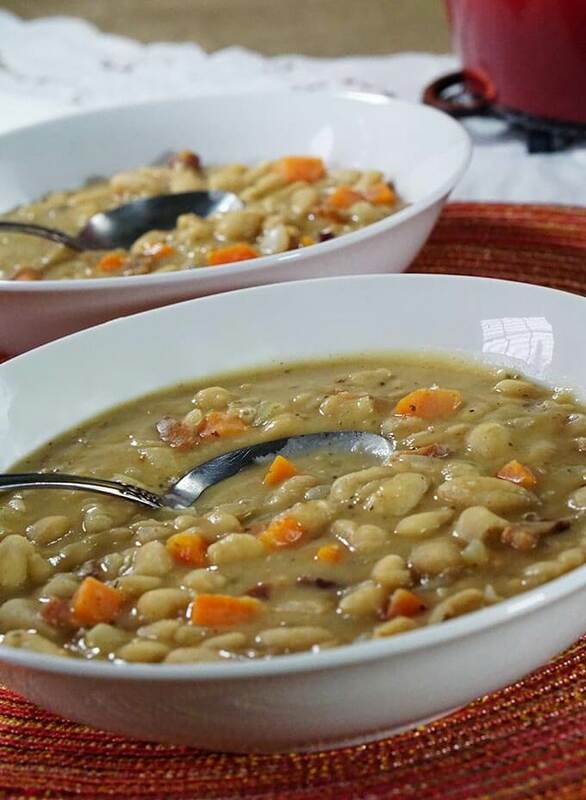 This Bean with Bacon Soup is rich, thick and delicious! 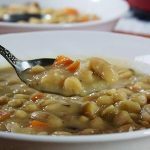 Easy and completely delicious this soup has all the flavor you normally get when bean soup is cooked all day long! Quick enough to be a weeknight meal too! Love the affordability you get from a great pot of beans. This meal offers 6 healthy servings. If you want to stretch it even further you could add additional chicken stock, however I like a good thick bean soup. If you want a big pop of heat I’d recommend a few dashes of tobasco sauce – it adds amazing flavor! Does your family eat soup year round or only in the fall and winter? 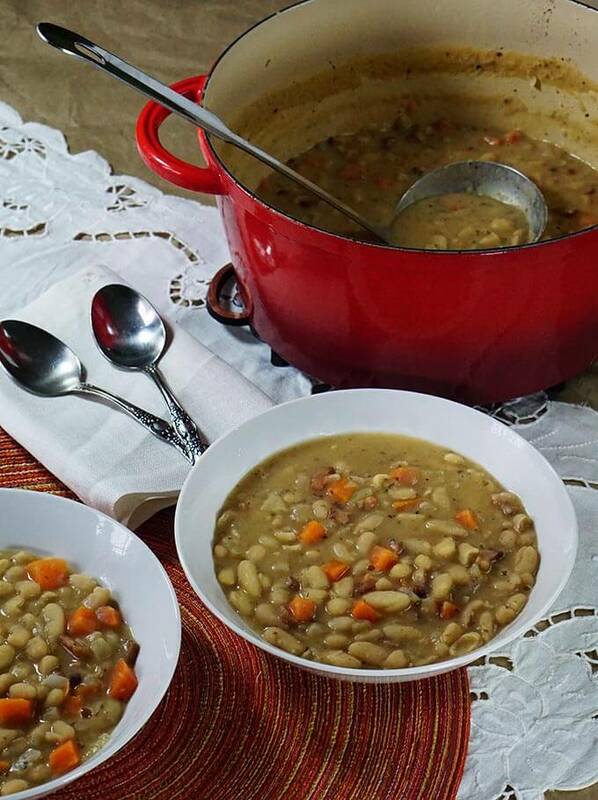 Love Bean Soup but don't have a day to make it? No problem! 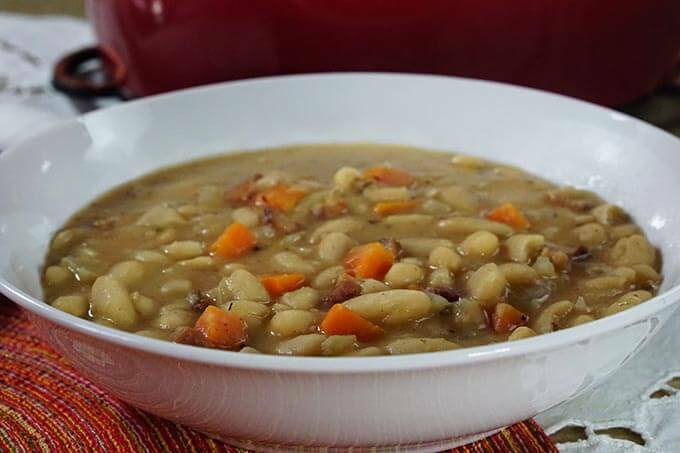 This delicious Bean with Bacon Soup has all the slow cooked flavor you love, but can be made quickly using pantry ingredients for an easy weeknight meal! 4 14.5 oz cans white beans - open 3 cans drain, rinse set aside. Open 4th can do not drain. Slice the bacon into a small dice. Add to a heavy bottom pan on the stove. After the bacon is diced and added to the pan, turn it on medium heat. Starting the pan cold and cooking it slowly will allow the fat to render from the bacon, leaving you with just the crispy pieces. This will take 10-15 minutes. While the bacon is cooking, chop the onion, peel and dice the carrot, mince the garlic. Open the cans of beans. Drain three cans and rinse them well, set them aside to drain. Open the fourth can, do not drain. Pour the 3 cans of drains beans into a blender. Add 1/4 cup chicken stock. Blend until smooth and creamy. When the bacon is crispy, remove it from the pan with a slotted spoon, Place it on a paper towel and allow it to drain. Remove the excess grease from the pan, but be sure to leave the browned bits, if necessary add a tablespoon of olive oil into the pan. Add the onions and carrots to the pan. Season the vegetables with the Italian seasoning, pepper and red pepper flakes. Sauté over medium heat for 3-4 minutes until the vegetables start to soften and begin to brown. Add the minced garlic and saute another minute. Next deglaze the pan with a couple tablespoons of white wine, being sure to scrape the brown bits off the bottom. Now add the reserved beans, blended beans and remaining chicken stock to the stock pot. Increase heat to high and bring to a boil. Reduce heat to medium and simmer at a low bubble for 10 minutes stirring occasionally. Add the bacon back in and give it a good stir. Check the seasoning. You may need to add salt, but only 1/2 teaspoon at the most. Remove from the heat and add in a squeeze of lemon & parsley. Adding this at the end will brighten the flavors in this delicious soup! 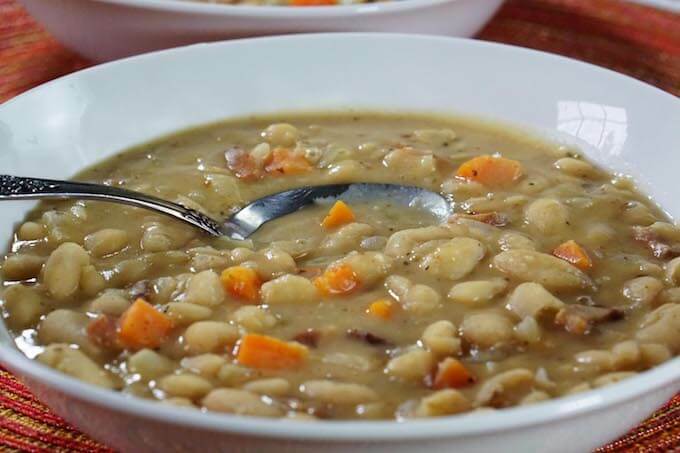 Love Bean Soup but don’t have a day to make it? No problem! This delicious Bean with Bacon Soup has all the slow cooked flavor you love, but it can easily be made using pantry ingredients for an easy weeknight meal! 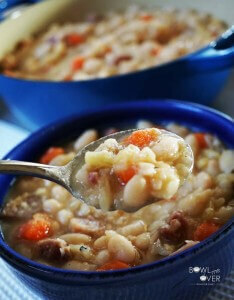 If you prefer Ham & Bean Soup, then I have you covered with that recipe also! Big slow cooked flavor – thick rich and delicious, oh YES this is amazing! Looking for a great side to go along with this meal? Skillet Cornbread is always a great choice! Homemade Bean with Bacon Soup first appeared on A Dish of Daily Life. This just looks so good I’m going to make it this afternoon. Love bean soup. Awesome Lois swing back by and let me know what you think!! Wonderful! I’m glad you enjoyed it as much as we did – such a yummy, easy soup. Thanks for letting me know!! My folks live just outa Portland and you guys in the Pacific Northwest have been getting some ugly weather. Stay warm and enjoy this soup! Bean and ham is our “go to” soup when the weather is bitter- like NOW! Thanks so much. Going to soak some beans right now! That’s the beauty of this meal – no soaking required! Just use a quick pantry shortcut! You guys stay warm, looks like it’s soup weather in Wisconsin! I love soup this time of year! This recipe looks like a winner. Thanks Kristina, I hope you give it a try! I haven’t had bean and bacon soup since I was a child. I’ll have to try this! You know I understand that. The canned version was often on the table when we were kids. I love this delicious fresh soup! What a gorgeous winter warmer soup this is! Just the perfect thing for after those chilly hill walks. Just got done with a brisk walk myself – great way to warm up I so agree! This soup looks fantastic! I agree, I don’t have time to cook dried beans. Besides, canned ones are always good! No worries there. My favorite soup is probably broccoli cheese. Maybe I’m saying that because it’s the last soup I made. Potato cheese is also a favorite. Hmmm, I notice a cheese theme! Never have too much cheese Debi – just puts a meal right over the edge! I love bean soup. I grew up with a pot after the holidays. Always used the hock to make the soup more delicious. Me too Christie – we always had a pot-o-beans simmering on the stove. I love that this makes it even easier! I love this recipe! It used to be my favorite canned soup until I looked at the nutrition label! Now I have a delicious go to that I can put together at home. I know – all that sodium? No thanks – draining and rinsing the beans helps a ton. I hope you give this easy soup a try – so yummy! I love bean with bacon soup and I love that your recipe can be made in such a short amount of time. It looks absolutely delicious! Thanks Lisa! I’m such a fan of soup (obviously!) I hope you give this recipe a try! I am sick today and now all I want is a bowl of this delicious soup! Looks AMAZING! I hope someone made it for you! I’m fighting a cold today too, UGH!! Enjoy that soup! One of my hubby’s favorites!! Then he will appreciate a big bowl of this yummy soup! 😀 Thanks for stopping by Michaela! January is always my favorite month because I can eat soup all the time! chilly weather and sweat pants are perfect for my not so ready beach body. Hearty soups are the way to go!! Yup, right with you there! Soup is good food! Thanks Angela, I really appreciate it, thanks for stopping by!